MANILA, Philippines - President Benigno 'PNoy' Aquino III delivered on Monday, July 27, 2015 his sixth and final State of the Nation Address (SONA). Lawmakers and guests at Batasan Pambansa in Quezon City gave him 146 rounds of applause with the loudest on his thanksgiving and valedictory speech. SONA 2015 has been the longest speech of Aquino on his five years in service. It started at exactly 4:00 in the afternoon and concluded after two hours and 15 minutes. Before the SONA, Communications Secretary Herminio Coloma Jr. said PNoy will emulate his mother Cory Aquino who looked back at history during her final SONA in July 22, 1991. As a result, PNoy made some rants to the previous administrations. "My bosses, this is the story of our journey along the Straight Path," Aquino started his speech. Aquino recalled the issues of former President Gloria Macapagal Arroyo (PGMA) administration that were inherited to him before his term in 2010 such as 'Hello Garci' scandal, ZTE-NBN deal, MWSS bonus, Maguindanao massacre, and NFA anomalies. "May naalala ba kayong nagsabing, “Sorry sa pagnanakaw at pang-aabuso, handa na akong magbago”? Ang sa akin lang po: Makaka-move on lang tayo kapag nakamtan ang katarungan," Aquino said. "The moment we assumed the presidency, we began to unearth anomaly after anomaly," Aquino added. The president boasts his accomplishments in fighting corruption and poverty under his "Daang Matuwid" campaign and trumpeted economic gains. "The reforms we have sown along the Straight Path will bear an even more bountiful harvest in the future," Aquino said. "Corruption was the root of our people's suffering. Our battlecry: where there is no corruption, there will be no poverty," Aquino said. He even highlighted “Kung walang corrupt, walang mahirap." Aquino lauded Commissioner Kim Henares as she spared no tax evader. 380 cases have already been filed against those who attempted to evade taxes. In 2014, the commission's collection went up to P1.3 trillion, this 2015, the collection up to P1.5 trillion. Aquino said the Philippines is now called Asia’s Rising Tiger, Asia’s Rising Star, Asia’s Bright Spot as the country was unanimously deemed investment grade by the most prominent credit rating agencies. According to him, around 80,000 new entrants join our labor force every year. In the manufacturing sector, there's a 3% average growth from 2001-2009, up to 8% from 2010 to 2014. President Aquino claims that our unemployment rate dropped to 6.8% last year and considered as the lowest recorded in a decade. Once again, Aquino highlighted the 'Pantawid Pamilyang Pilipino Program' or 4Ps which now have 4.4 million beneficiaries from 786,523 in 2010. In 2008, there were 2.9 million out of school youth in the country. In 2013, only 1.2 million out of school youth remained. On education sector, PNoy said that Alternative Learning System helped to ensure that even indigenous peoples and street children are not left behind. He also gave update and requirements for K to 12 program - backlogs of 66,800 classrooms, 145,827 teachers, 73.9 million textbooks already provided. The president also explained why K to 12 was implemented, he said: "We implemented K to 12 because it is not practical to cram learning in a 10-year basic education cycle." For the 2016 proposed budget, around 103.2 million textbooks and 4.4M chairs already included. For TESDA program of the government, studies show that 71.9% [of TESDA graduates] found employment right away, compared to the 28.5% recorded before. In the health sector, 89.4 million Filipinos are already member of Philhealth program. Beginning in 2014, for the poorest 40 percent of the population, treatment in public hospitals is free. In social welfare, PNoy said that in the Sitio Electrification program, 25,257 sitios out of 32,441 were served. In aviation, ICAO lifted the safety concerns it imposed to the Philippines in 2013. The EU Air Safety Committee lifted the travel ban in all local carriers. Now, all our airlines will be able to fly directly to the United Kingdom, Italy, and other countries part of the EU. For the unresolved problems on Metro Rail Transit (MRT), Aquino said plans of purchasing of new MRT train coaches. He said that the process to obtain new MRT rails underway, together with the upgrading of the signaling and automatic fare collecting system but failed to mention the target timeline for the project. For Armed Forces of the Philippines (AFP) modernization, the government has plan to buy 2 more C-130. There will be additional 6 landing craft utilities and 3 C-295 medium lift transport. He also mentioned the PNP Capability Enhancement Program of which 2,523 patrol jeeps and 577 utility vehicles were purchased. He also boasts the 'Oplan Lambat Sibat' to arrest criminals. On his term, he said that 163,000 most wanted criminals were seized including Marwan and Usman. Aquino cited the long-awaited infrastructure projects such as Muntinlupa-Cavite Expressway (MCX) and Tarlac-Pangasinan-La Union Expressway o TPLEX and the ongoing projects including Cavite-Laguna Expressway, Skyway Stage 3, and NLEX-SLEX Road. The Laguna Lakeshore Expressway Dike will be awarded this December. Aquino mentioned the latest survey from SWS that 8 out of 10 Filipinos believed that the country will be included in the list of developed countries. Based on Gallup survey, the Philippines has the highest optimism in Asia Pacific and second highest in the world. The president also included on his SONA the update on car sales in the country which is up in 27% in 2014. PNoy also wish to pass the Bangsamoro Basic Law by the Current Congress. "Ilang buhay pa ang kailangang ibuwis para magising ang lahat sa obligasyong baguhin and sirang status quo sa Muslim Mindanao?" When he mentioned his interest on Anti-Dynasty Law, it received the loudest applause from SONA expectators. "Panahon na para ipasa ang isang Anti-Dynasty Law." PNoy also thanked Congress and Senate for other bills and acts such as Philippine Competition Law, Sin Tax Reform Act and Responsible Parenthood Act. The president also praised officials of the government for their contributions, sacrifice and wellspring of inspiration to the nation. He lauded Interior and Local Government Secretary Mar Roxas. "Mar, pinatutunayan mo: You can't put a good man down." Aquino highlighted the Gross Domestic Project (GDP) growth of 6.2 percent from 2010. "If we reach 6.8 percent this 2015, then we will have posted the fastest 6 year average growth period in almost six decades." He added that the next administration should continue to promote the same advocacy. "The next election is a referendum for the Straight and Righteous Path." But PNoy did not mention his bet for the next presidential race. "Taas-noo na tayong humaharap sa mundo at nasasabing, "Kaya ko. Kaya ng Pilipino. #SimulaPaLangIto. This is only the beginning. We are only in the 1st chapter of the great story of the Filipino people," Aquino concluded his speech. 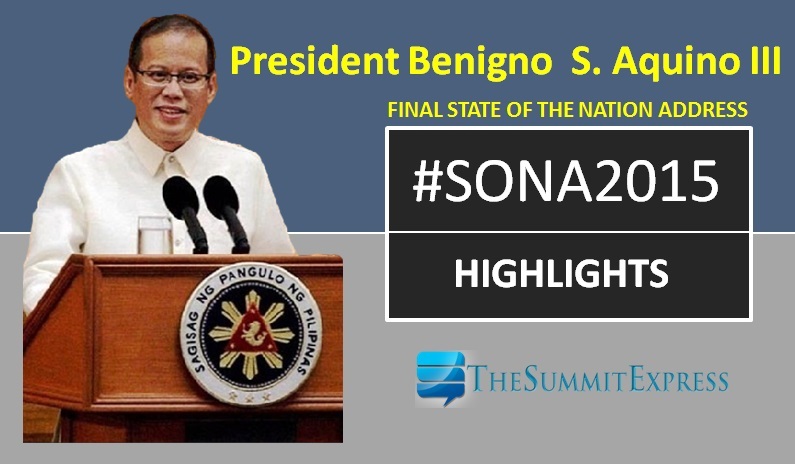 SONA 2015 highlighted the achievements of the government in transportation and communications, tax/revenue, labor and wages, international relations, education, budget and finance, peace, social welfare, justice, disaster preparedness, national security, economy, infrastructure, governance and reform. The president didn't defend our claims against China’s expansionism in relation to West Philippine Sea dispute. In addition, Aquino did not mention the issue on the Priority Development Assistance Fund (PDAF) with many of the politicians are involved. He has no words also for January 25 Mamasapano operation, which left over 60 people dead including 44 police commandos. PNoy also failed to include the passage of the Freedom of Information (FOI) bill in his SONA. The measure aims to eliminate corruption in the bureaucracy by giving the public greater access to government transactions and records. Despite of the said achievements and plans of the government, Anakpawis, Bayan and other militant groups unfazed by heavy rain marched along Commonwealth Avenue in Quezon City toward Batasan Pambansa on Monday morning. “Kung Mayo Uno nga, wala kaming napala, SONA pa kaya ng isang narcissistic na pangulo,” Bukluran ng Manggagawang Pilipino (BMP) chair Leody de Guzman said. On Monday, Social Weather Stations (SWS) has released second-quarter survey results which shows that 11.2 million families or 51 percent of Filipino families considered themselves as 'poor'. In the survey, self-rated poverty was also at 51 percent the previous quarter, and was at 52 percent in the fourth quarter of 2014.